JANUARY 2019 I DESIGN007 MAGAZINE 9 and in their eyes, the OEMs have been reaping the rewards. Turnabout is fair play, after all. Where does this leave you and your next design? We asked our expert contributors to explain the current component shortage, as well as some of the workarounds that can help you get your next design out the door sooner rather than later. 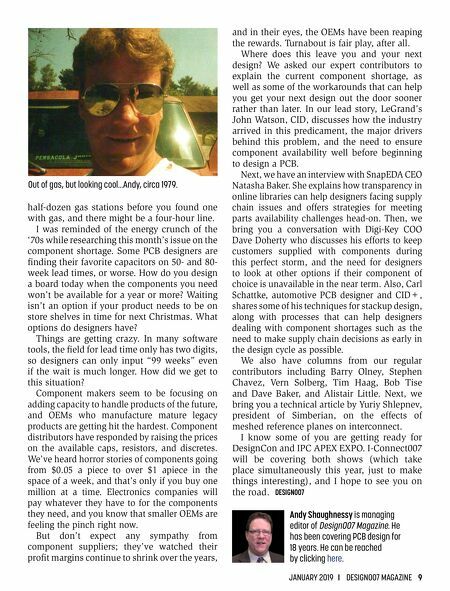 In our lead story, LeGrand's John Watson, CID, discusses how the industry arrived in this predicament, the major drivers behind this problem, and the need to ensure component availability well before beginning to design a PCB. Next, we have an interview with SnapEDA CEO Natasha Baker. She explains how transparency in online libraries can help designers facing supply chain issues and offers strategies for meeting parts availability challenges head-on. Then, we bring you a conversation with Digi-Key COO Dave Doherty who discusses his efforts to keep customers supplied with components during this perfect storm, and the need for designers to look at other options if their component of choice is unavailable in the near term. Also, Carl Schattke, automotive PCB designer and CID+, shares some of his techniques for stackup design, along with processes that can help designers dealing with component shortages such as the need to make supply chain decisions as early in the design cycle as possible. We also have columns from our regular contributors including Barry Olney, Stephen Chavez, Vern Solberg, Tim Haag, Bob Tise and Dave Baker, and Alistair Little. Next, we bring you a technical article by Yuriy Shlepnev, president of Simberian, on the effects of meshed reference planes on interconnect. I know some of you are getting ready for DesignCon and IPC APEX EXPO. I-Connect007 will be covering both shows (which take place simultaneously this year, just to make things interesting), and I hope to see you on the road. DESIGN007 Andy Shaughnessy is managing editor of Design007 Magazine. He has been covering PCB design for 18 years. He can be reached by clicking here. half-dozen gas stations before you found one with gas, and there might be a four-hour line. I was reminded of the energy crunch of the '70s while researching this month's issue on the component shortage. Some PCB designers are finding their favorite capacitors on 50- and 80- week lead times, or worse. How do you design a board today when the components you need won't be available for a year or more? Waiting isn't an option if your product needs to be on store shelves in time for next Christmas. What options do designers have? Things are getting crazy. In many software tools, the field for lead time only has two digits, so designers can only input "99 weeks" even if the wait is much longer. How did we get to this situation? Component makers seem to be focusing on adding capacity to handle products of the future, and OEMs who manufacture mature legacy products are getting hit the hardest. Component distributors have responded by raising the prices on the available caps, resistors, and discretes. We've heard horror stories of components going from $0.05 a piece to over $1 apiece in the space of a week, and that's only if you buy one million at a time. Electronics companies will pay whatever they have to for the components they need, and you know that smaller OEMs are feeling the pinch right now. But don't expect any sympathy from component suppliers; they've watched their profit margins continue to shrink over the years, Out of gas, but looking cool...Andy, circa 1979.